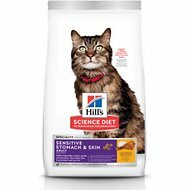 Make every moment together with your feline friend a little more special when you’re feeding her Hill's Science Diet Adult 11+ Indoor Chicken Recipe Dry Cat Food. 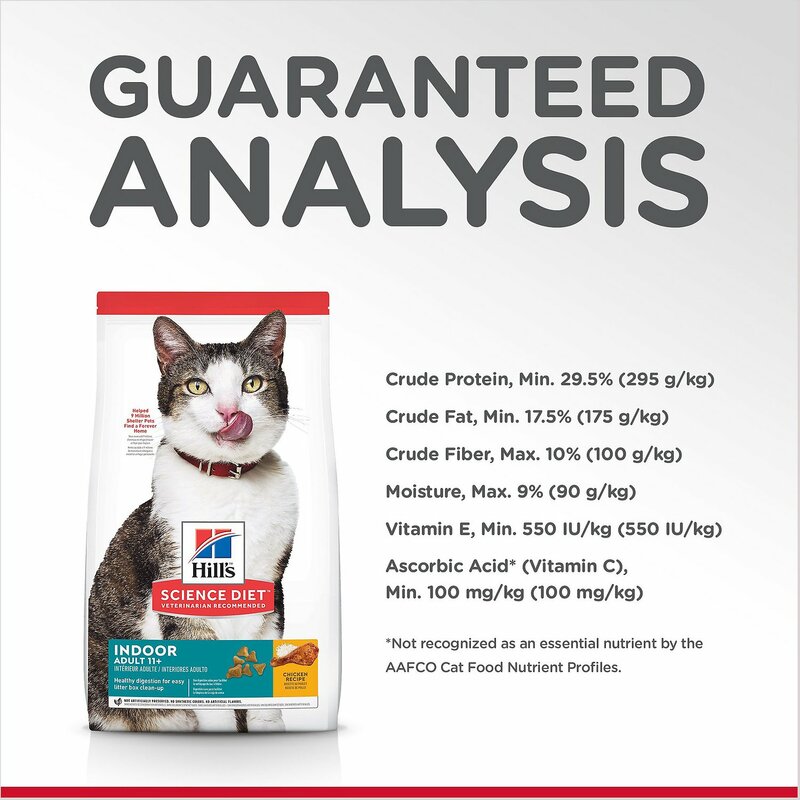 Featuring real chicken as the very first ingredient, it’s scientifically formulated to provide complete and balanced nutrition that supports the youthful vitality of your senior indoor cat. 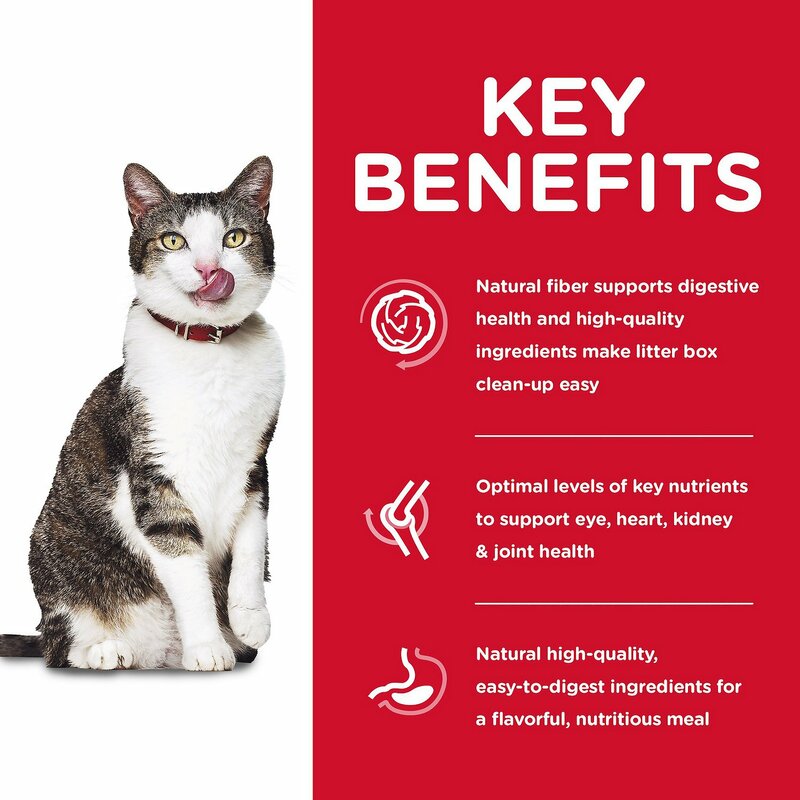 Natural fiber gently reduces hairballs and supports her digestive health, while the added vitamins, minerals and nutrients deliver clinically-proven antioxidant benefits. Real chicken is the very first ingredient in this highly-digestible, flavorful recipe that’s scientifically formulated to provide complete and balanced nutrition. Clinically proven antioxidant blend including vitamins C and E supports strong immunity and youthful vitality. Essential nutrients help maintain eye, heart, kidney and joint health as your feline friend ages. Natural fiber helps reduce hairballs, aids digestion and makes litter box clean-up quick and easy. Made in Hill’s U.S. facilities using high-quality ingredients and no artificial colors, flavors or preservatives. New Formulation: Chicken, Whole Grain Wheat, Corn Gluten Meal, Chicken Fat, Powdered Cellulose, Wheat Gluten, Chicken Liver Flavor, Dried Beet Pulp, Brewers Rice, Lactic Acid, Potassium Chloride, Fish Oil, Calcium Sulfate, Choline Chloride, Calcium Carbonate, Dicalcium Phosphate, Taurine, vitamins (Vitamin E Supplement, L-Ascorbyl-2-Polyphosphate (source of Vitamin C), Niacin Supplement, Thiamine Mononitrate, Vitamin A Supplement, Calcium Pantothenate, Riboflavin Supplement, Biotin, Vitamin B12 Supplement, Pyridoxine Hydrochloride, Folic Acid, Vitamin D3 Supplement), minerals (Ferrous Sulfate, Zinc Oxide, Copper Sulfate, Manganous Oxide, Calcium Iodate, Sodium Selenite), Iodized Salt, L-Carnitine, Mixed Tocopherols for freshness, Green Peas, Natural Flavors, Apples, Cranberries, Carrots, Broccoli, Beta-Carotene. 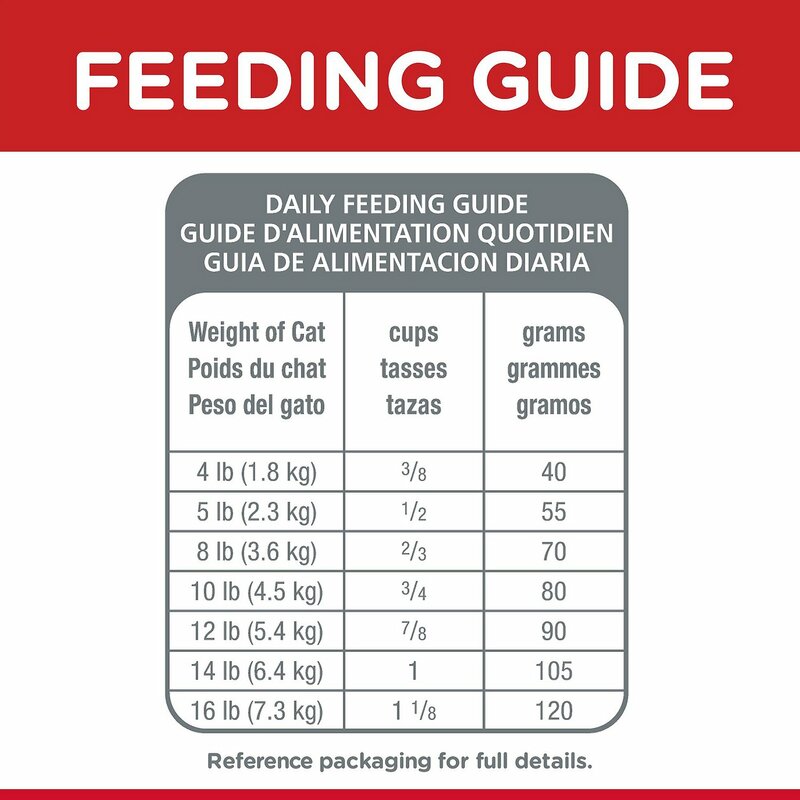 Adjust feeding amounts as necessary to maintain optimal weight. If you are unsure, ask your veterinarian. New to this food? Mix increasing amounts of your pet's new food with decreasing amounts of the old food over a 7 day period. Keep fresh water available at all times! Your pet's nutritional needs may change as they age. Ask your vet at every checkup. 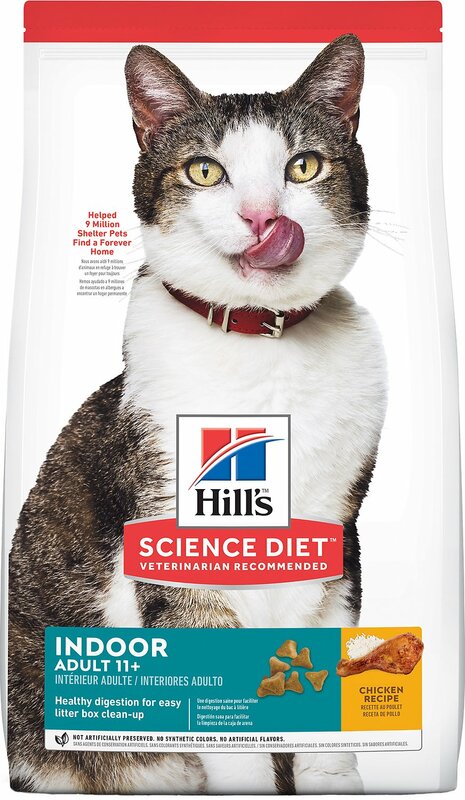 Science Diet is available in a wide variety of dry foods, wet foods and treats for your pet's unique needs. Begin the transition by mixing both the current food and their new cat food together. Gradually decrease the amount of the current cat food while increasing the amount of new cat food. Continue to do this over a 7-day period. Transitioning slowly can result in fewer digestive issues and better acceptance of the new cat food. Mix 25% of the new food in with 75% of the current food for the first 2 days, then mix 50% new food with 50% existing food for the next 2 days, then mix 75% new food with 25% current food for the next 2 days. By day seven, you can feed your cat 100% new food. Because my girl cat has CKD, the diet I feed them is necessarily limited. Because they're both grazers, and it's impossible to feed them separately, I had to find a food that will suit them both. This seems to do the job. It's on the low end of protein and phosphorus, but it's got the nutrients they need. And my boy cat, who loves dry food more than life itself is satisfied. You do what you can, and this helps me do the best for my kids. Mine is an older, even elderly cat at going on 16 years. She's had a number (but not all) of her lower molars extracted and thus cannot break-up larger pieces of dry food. This formulation is very small bits that she can mostly swallow whole. She also seems to really like the taste. I like that it is a better quality and more nutritious food than most. Our nearly 15 yr. old cat, Emmy, loves this food ! We had her on Hill's prescription food for years. She was so tired of it. I switched her to this & boy, she is eating much, much better now. She's a happy girl. My 2 older finicky 14 yr old cats liked the old formula but when I reordered they liked the new formula even better and now refuse to finish the old bag. Tried to mix and they just eat around the old formula in favor of the new so all good! We have 2, 16-year-old, sibling kitties that are starting to have more health issues which included UTI's recently. 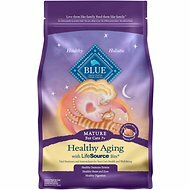 I decided to look into senior foods that may be better for them and found this one. They sure seem to like it because they picked it out of their old food when I was trying to transition it! Will continue to see how it works for them! 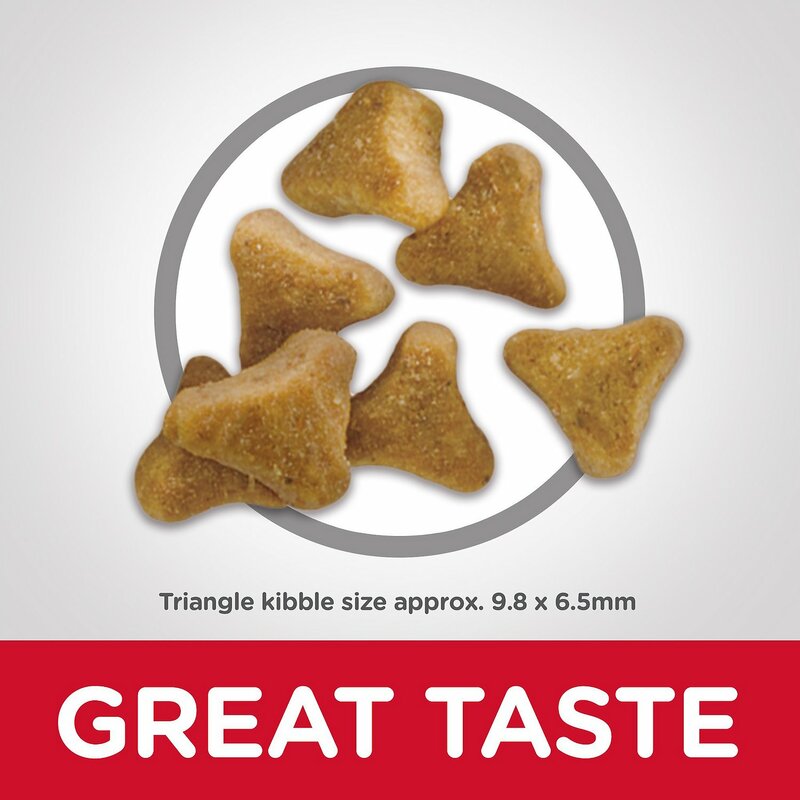 Only thing I wish was that it was a smaller kibble - pretty large for kitties with old teeth. Generally my cat isn’t very picky bout the doors she eats. I thought I would give this a try, last time I ordered food for my dogs. She loves it! She pesters me at feeding time until I get her food in her bowl. We are so happy! Tripod is a special needs kitty with lots of physical challenges. She is also getting older and living way past the age the vet thought she would. She loves Hill's science diet and has a new spark to her plus a shinier coat. thank you !! I like the quality of the food ingredients. My cat is somewhat less than impressed, but he'll eat it. Like that it's geared toward the much older cat. 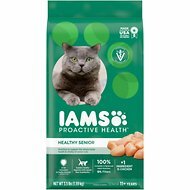 I ordered this particular cat food as it was the closest kind that I wanted for my elderly cats. The cats love it and I have to give them the food more as a treat than regular food or they would gorge themselves. Every morning my female cat sits by her dish waiting for me to give her some of this food even though there is other food available in her dish.